$1 Shipping Fall Wine Sale - Early Access for VIPs! As a 30 Second Wine Advisor reader, you are invited to shop The California Wine Club's $1 Shipping Fall Wine Sale before it officially opens on Aug. 21. Stock up for the holidays with 200+ wines on sale for as low as $9.99. Every wine is handcrafted and guaranteed to be delicious. We're enjoying an unusually cool summer, but it's still the "dog days," when light summer fare and cool, refreshing whites seem made for the season. But nowhere is it written that cool, refreshing whites need to be boring! In the quest for summery yet interesting whites, we're devoting the monthly Wine Focus in our online WineLovers Discussion Group to a quest for bracing draughts from all around the Mediterranean basin ... and a bit beyond. From Spain we'll work across Southern Coastal France - Languedoc and Roussillon through Provence to Italy's shores, the coastal Balkans, Greece and the Greek islands; Turkey's coastal regions to Lebanon, Israel, even North Africa if we can find any; and complete the circle by passing through Gibraltar to Portugal, which faces the Atlantic, not the Med, but still seems to fit in. We'll find a lot of Grenache Blanc and plenty of Viognier, I imagine; and better yet, there are tons of indigenous white varieties to discover, from Alvarinho to Rueda, Picpoul, Greco di Tufo and Grillo, Kujundzusa, Assyrtiko, Emir, Obaideh and Merwah and many, many more. So, bring your whites from the Med and Portugal. Serve them cool, but not ice-cold, please: There's no point in stunning our taste buds and losing the good flavors that make fine wine worth the price. Then, please share your questions and comments and contribute your tasting notes in Wine Focus. Just click Wine Focus for August: Whites of the Med, Plus to drop in. You'll be warmly welcome in our friendly wine-loving community. All forum discussions are open for public viewing, but you must register to post your comments and participate actively in the conversation. Registration is free and easy; we ask only that you join following our Real Names Real Format system, using your real name as your public user name. To join the forum, drop me a note at wine@wineloverspage.com with your real name, preferred format and a temporary password, and I'll take care of the rest. Or, if you like, come over and post your tasting reports on our recently revamped WineLovers Facebook Page, where you can keep up with The 30 Second Wine Advisor as well as checking in on occasional wine news and active topics on the WineLovers Discussion group. If you stop by, I'll appreciate it if you "Like" the Page. Then take a moment to comment on any of the topics you find there. See you online! As a 30 Second Wine Advisor reader, you are invited to shop The California Wine Club's $1 Shipping Fall Wine Sale before it officially opens. Stock up for the holidays with 200+ wines on sale for as low as $9.99. Every wine is handcrafted and guaranteed to be delicious. Sale opens to the public Aug. 21, 2014. California is home to thousands of small family wineries handcrafting extraordinary wine in quantities too limited to be found in local stores or shops. In 1990 wine club founders Bruce and Pam Boring discovered that these winemaking families were the most passionate in the wine world and that their wines were the hidden gems of wine country! Together Bruce and Pam embarked on a journey to help these artisan wineries introduce their exquisite wines to the world. Learn more. FOOD MATCH: It should serve well with shellfish, particular sweeter options such as crab. It was fine, too, with caprese, an Italian summer salad of ripe, juicy tomatoes, creamy fresh mozzarella, just picked basil chiffonade and fruity green Italian olive oil. WHEN TO DRINK: Light, fresh and aromatic, and sealed with a sturdy modern metal screw cap to keep it that way, it should hold for two or three years in cool storage, but I see no reason not to enjoy it soon. VALUE: A fine, interesting summer wine, and a good value at this price, which is within range of the median $12 U.S. retail listed at Wine-Searcher.com. 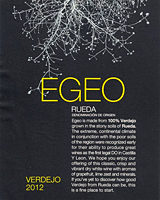 WEB LINK: Here's a fact sheet on Egeo 2013 Rueda Verdejo on the importer's Web page. Find vendors and check prices for Egeo Rueda Verdejo on Wine-Searcher.com.